Thinking back to the classic Chinese soups I grew up with at home, one of my favorites is this Water Chestnut Bean Curd Barley Soup. This has been a favorite of mine since I was a little kid. I love the aroma, sweetness, and meaty bite that shiitake mushrooms provide. I also love the soft, silky smooth feel of the bean curd skin in my mouth. The water chestnut also provides a nice, clean and light sweet flavor to the soup. As I grew older and started making this soup myself in the kitchen, I was delighted to learn that this soup is actually very easy to make. You simply rinse and soak the dry ingredients while blanching the pork. After that, you throw the ingredients into a pot and let them cook with water. 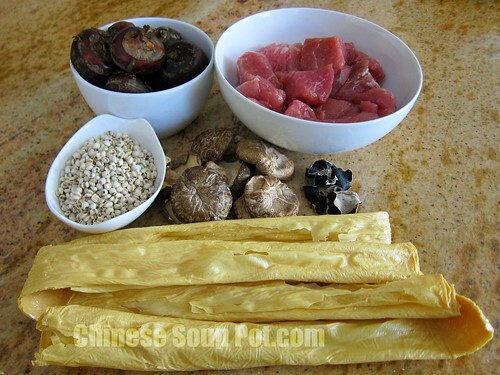 Many of the ingredients in this soup, like shiitake mushroom, barley, bean curd skin, and wood ear are also such common soup / cooking ingredients that I usually have them in my kitchen. 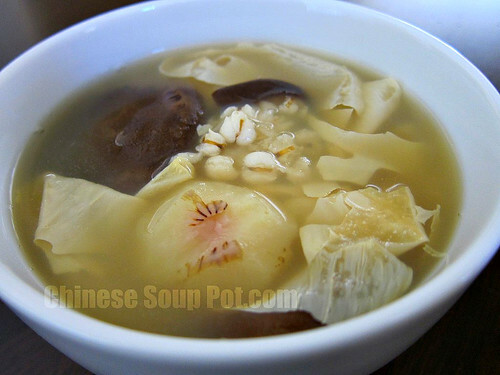 When I see good water chestnut in the supermarket, I would often buy them to make this soup. I was also very happy to learn from my mother that this soup provides a practical health function that I can appreciate. The soup is neutral in property while enabling the body to release heat and lowers blood pressure. Neutral and heat are fundamental Chinese medicine terms that describes a state of a person’s internal body, or the nature of a food. When one’s internal body is unbalanced, heaty for example, outward symptoms like sore throat, dry eyes, burning sensation in the eyes, or even acne can appear. Since I often do not seem to get enough sleep and have a tendency to get off balance towards the heaty side, this is yet another reason why I love this classic soup so much. Break off stub from the dried shiitake mushroom. Rinse and soak separately the barley, wood ear, shiitake mushroom and stubs. Break the dried bean curd sticks to the length of your pinky finger. Let soak in cold water. Blanch the pork chunks while bringing a large pot with 12 cups of water to boil. Rinse and peel the water chestnuts. Cut each water chestnut across in half and set aside. When the large pot boils, add the blanched pork, barley, water chestnut, ginger, shiitake mushroom and stubs. Cover and boil on high heat until the liquid bubbles. Then turn down the heat and let simmer for 1 hour and 15 minutes over low heat. Set your timer. When the timer signals, add the bean curd sitcks, and wood ear to the pot. Continue to boil over low heat for another 45 minutes. Sprinkle some salt to season. Serve. 1. See the shiitake mushroom and water chestnut page in the Common Ingredients section for information on nutrition, health benefits, and buying tips. Many of your recipes ( Chinese Herbal Recipes) call for pork in them. As I can’t eat pork, is there a healthy alternative (meat/fish/vegetables) that can deliver similar results? Thank you very much for your visit and for your question! If you cannot eat pork, other meats like chicken or fish can certainly be substituted. I have also used quail to make soups as another alternative. When substituting herbal recipes with other meats, it is important to understand the warm/cold properties of the meat and herbs used. If you are intending to make a cooling soup (e.g. to rid excess internal body heat), it would defeat the soup’s health function to substitute in chicken which is a warm food. Quail meat is neutral. So perhaps quail can be your substitution meat if you are not sure whether chicken or fish can be used. You can also see my soup recipes using fish / other seafood for additional ideas. I will also try to add a note to my future recipes to indicate if other substitution meats can be used. Thank you again for your visit and the question. I’m in my early 20′s and wanting to learn more about my parents yummy and healthy soups. We live apart from each other and so sometimes it’s hard to understand the ingredients they are trying to describe to me in Chinese. I find your site very helpful and I hope to try out many of your soups! It’s a great resource and you come across as quite knowledgeable about the ingredients and their nutritional benefits as my own mother would describe to me. Thanks! Thank you so very much for your visit and for sharing your story! I am so happy to see that you find my site resourceful! I hope you find many soup recipes and ingredients here to try. Like you, I live apart from my parents now. Making these soups that I grew up with always somehow make me feel closer to my parents. Thank you again for your visit and comment! Enjoy your soup!